Sara Grazia is considered Australia’s ‘Sausage Queen’ and has been successfully running sausage and charcuterie making courses and workshops all over Australia for several years. She has appeared on Australian television and has written three best-selling books on sausage making as well as producing an instructional DVD on the subject. Sara also has a successful online business for selling everything related to sausage making. She grew up in an Italian household in Australia and was involved in the family sausage making activities from an early age. She spends as much of her free time in Italy, learning techniques from all the over country to make different types of sausage and charcuterie in her premises in Melbourne. Sara’s goal (now achieved) was to open a ‘Sausage Headquarters’ in Melbourne, Australia, where not only could she produce charcuterie and hold her renowned courses and workshops, but also to offer a selection of genuine Italian products imported directly from Italy. 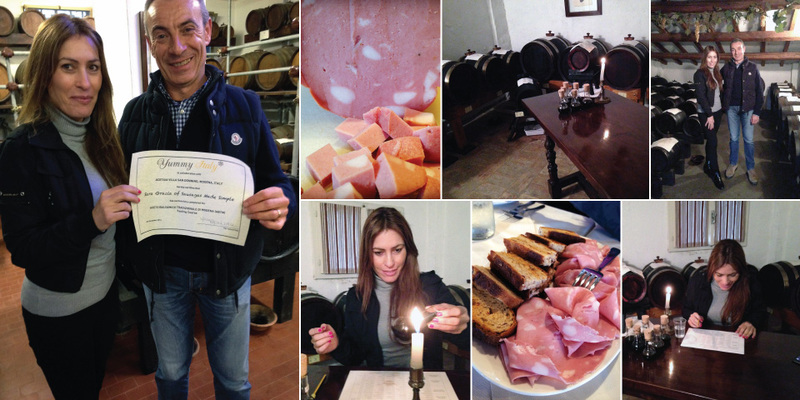 She reached out to Yummy Italy as she was interested in doing some authentic Mortadella tasting – both industrial and artisan. Being a food lover and a professional, she also wanted learn more about the differences between the various types of Balsamic Vinegar (both PDO and PGI) with a view to offering a selection in her store. We set up a series of tastings of Mortadella, from the industrially-made to those made by small, artisan producers considered the finest, as well as unique ‘organic’ Mortadella made from the meat of the ‘Mora Romagnola’, a highly-prized black pig that almost became extinct. Sara also learnt about a unique product called ‘Salame Rosa’, only made by one artisan producer and considered the most noble of Mortadellas. Sara also carried out a guided Aceto Balsamico Tasting course by candlelight, first learning about the complex history and production techniques surrounding this unique product and finally understanding the criteria set out to establish the ‘benchmark’ for the Traditional Aceto Balsamico di Modena. We also studied the lesser, but nevertheless, optimum products, learnt about food pairings and the best way to serve the various vinegars of different maturations. She finished her course being fully equipped to select the right products for her gourmet clientele.